Sound like something you would have written? Finding the perfect cheerleading shoes is hard. How do even know which direction to start in? Well don't worry! That's why we're here to help you. If we know anything at all, it's cheer shoes. Cheer surface. The surface you are going to be cheering on is probably the number one factor in finding the correct shoe. You wouldn't believe the number of people that purchase an indoor shoe for football season and are bummed when they don't hold up. On the field: Your team is game day focused. You need a good supportive all leather shoe. As shoe that is durable enough to perform on all weather conditions and handle the hard outdoor surface. On the mat: Your motivation lies on the mat. Perfecting your tumbling skills and prepping for competition. A fierce shoe that can keep up with you is a must. Something flexible, lightweight, and form fitting. In the gym: The gym is your home. Working on new half-time routines to amp up the crowd. You need a shoe with a solid rubber non-marking sole with enough cushion to keep you going. Cheer Level: Recreational (also called Pop-Warner cheer in many areas) vs. 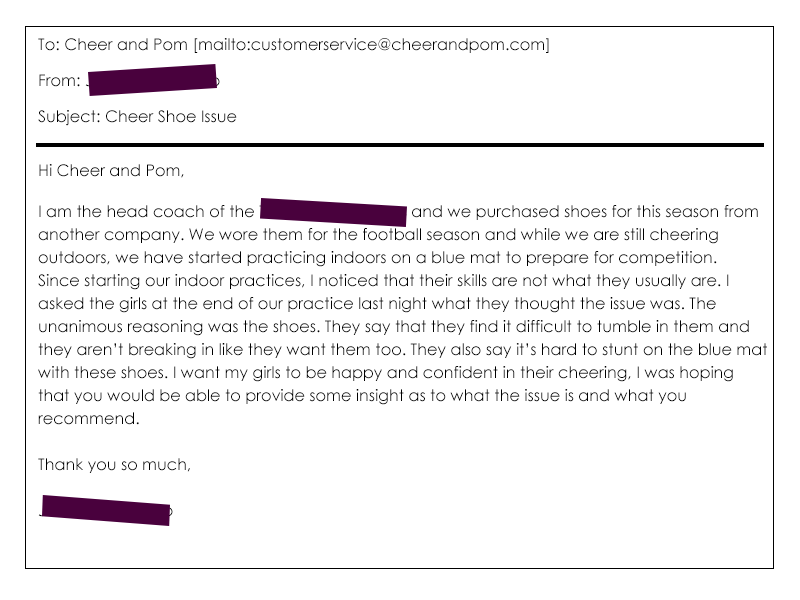 Competitive level cheer is also important when choosing a cheerleading shoe. Your shoes need to keep up with you and your skills. You wouldn't want to be a on a level 5 all-star cheer squad with shoes that won't allow you to tumble would you? Of course not! Recreational: Typically, a recreational or Pop-Warner cheer squad/organization, is a community team that is not formed soley for competition. While most rec teams do compete at least once a year, that is not their main goal. Their main purpose is to cheer for a local youth sports team. Competitive level: Competitive cheerleading teams, also known as all-star cheer squads, are privately organized cheer teams. They're fierce and have incredible dedication to the sport. They spend anywhere from 3-5 nights on the mat refining their skills. Their sole purpose is competitions. They also typically do not cheer for any local youth sports teams. See how simple we make it for you? Check out the infographic below for more insights and our cheer shoe picks! Still need help figuring it out? Call us! 877-200-4944, M-F 8AM-5PM CST or email us at customerservice@cheerandpom.com. Our amazing customer service team is there to help you. From finding the right style of shoe, finding one to fit your budget, to sizing recommendations and much more, they're there to make sure you get what you need. These are great tips when it comes to cheer shoes. I know personally that when it comes to cheer shoes, if you don't have a good feeling pair on then your whole performance is off. This is great information and I cant wait to share this with others and use this information some day while owning a cheer gym!